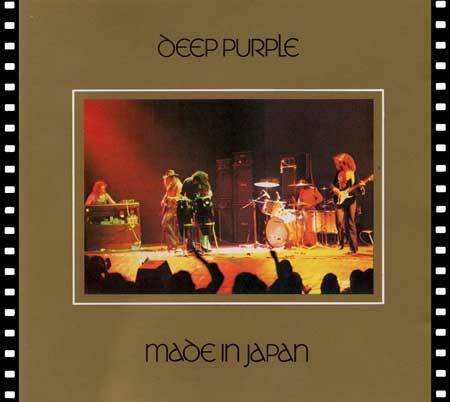 Deep Purple’s Made In Japan concerts were filmed. At least in part. Seven reels of silent 8mm footage filmed at Deep Purple’s famous August 1972 Japanese concerts have been found. Rumours of such film have persisted for years, and now their existence has been verified. Audio recordings of these three concerts formed the basis of the Made In Japan album released in 1973 and the Live In Japan 3CD released in 1993. The good news is that a 90 second portion of Highway Star from the silent film has been synced to audio and will be included on the upcoming History, Hits & Highlights 2DVD released on June 1 2009. The Highway Star is hoping to show stills from the footage shortly. The bad news is that the rest of the 26 minute film is made up of many short excerpts from different songs, and for that reason will not make it onto the History, Hits & Highlights DVD. Later, it is hoped that a Made In Japan documentary DVD featuring the full film can be put together and styled after the Classic Albums series. 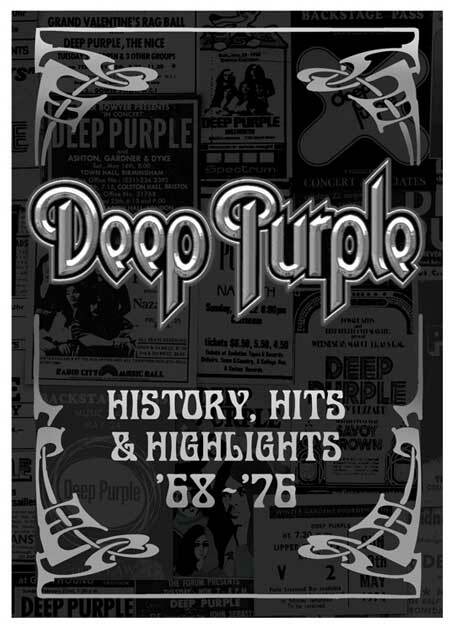 Further details on History, Hits & Highlights confirm that the DVD set will include complete versions of the surviving footage from Pop Deux, Paris 1970; Southbank, London 1970; Black Night, Top Of The Pops 1970 and Speed King from the Vicky Leandros Show 1970. The DVD will also include some of the material from Doing Their Thing 1970 and Tokyo 1976 – but not all. The latter was previously released as Rises Over Japan. It is hoped that all five surviving tracks from this show can be included with the remastered Come Taste The Band planned for 2010. Footage from Hamburg 1970 was found­ too short to use in any way. Further sources of 1970s film of Deep Purple are currently being chased, and the producers ask that you come forward via The Highway Star if you have knowledge of further film clips of Deep Purple 1968-76 that would be suitable for ínclusion on the History, Hits & Highlights DVD. Posted by Rasmus Heide on Friday, March 13th, 2009, filed under News. You can follow comment on this post through the RSS 2.0 feed. You can leave a comment below, or trackback from your own site. Didn’t I just say this in the other page. this is fantastic news. im wondering who is the source. i mean, who did “verify” it, and where these reels are from. any ideas? If it is true, this is the most important material of the history of Deep Purple. I wouldn´t mind to wait another year if they included all this ffotage synched to audio in the upcomming dvd! If hamburg footage is too short, they could include it as a background menu, much like the LED Zeppeln DVD. this is very exciting. i for one am getting tired of the holding back (hoarding of this stuff). put what exists of hamburg on and as far as bilzen 1969, put it all onto one set so we do not have ‘wring that neck’ on this upcoming set, and the ‘drum solo’ and ‘mandrake root’ on ‘greatest hits and more vol.2’! 26 minutes, and only a 90 second glimpse, not much to uproar over… but it is better than nothing concerning what it is. Made In Japan. Best Live album period! The whole Japan tour was great, and I adore it too. But in my opinion which tour was the greatest (in sound, and of course in singing) was there 1971 tour. The whole tour was magnificant, but unfortunately there are no official releases from that year, not a single one. Have anybody noticed that conclusion. It’s a real pitty, but hey there are always fantastic bootlegs to hear :). Anyone know if the footage is color or b&w? I persume that the color of video footage is going to be similar to the color of the picture from the front cover of Made In Japan. This HAS to be released. They will make millions with this material. The front cover shot, ironically was takken at the Rainbow Theater. so it is very strange ! things like this appear from time to time. thankfully!! It is great news, and the rumours, that there were cameras are true now. Fine. But – what about quality? Only one camera? Shots from far away or from stage? We will see. Anything is better than nothing. It was said on deeppurple.net, that the DVD will included some material, which even bootlegrs don’t know. This is the first one. All other assumed amterial is much known. Hope there will be more. For example, I’m pretty sure, that the whole Montreux 1971 is in Claude Nobs archives. Or what about the Boblingen scence, which is known? How can you beat Simon to this news? They should put the whole 26 minutes on the DVD! It doesn’t matter that is a bunch of short clips. Just put some music underneath the video! Remember the silent 8mm video from the Cal Jam, with the overdubb sound? They should to the same thing. Everybody would want this to happen, some of the fans have been waiting for more than 30 years!!! Great news, and as I have said many times before: MORE MORE AND MORE from those days where Deep Purple WAS Deep Purple and by far the greatest band in the world. As everyone has already said here: This is exciting! spread the whole footages splitted in tiny separate pieces. We all already have quite a massive dvd collection of the band. The vaults…I´m very sure there´s always something to be found. Great Spring for all of You and The Band, of course. When Bruce said there was nothing that might have been true to a point. We don’t know who filmed this. Was it done with permission at the time? Maybe not. So the band might not really have known about this footage. And as Karl Heinz said…how many cameras were there? If there were more than one that kind of implies there might have been permission. My guess is one camera. I just hope that it is color and well lit. I agree they should just release all of the bits that are too short to match to the music in one long 26 min clip. Us fans can match it up later!! There is a chance the quality could be poor. I hope not. But just because it is 8mm doesn’t guarantee poor quality. It is film stock. I have shot super8 myself with great results. As long as your camera is quality you can achieve some really nice stuff. The only thing you can really count on is it will be more grainy than 16mm or 35mm. But I have seen some stuff over 30 years old that was great. Here is hoping the guy(s) who shot this knew what they were doing. Does anyone know anyone at Eagle we can email/contact to include all of the footage? It isn’t too late. I don’t think I want to wait another 8 years for a Made In Japan DVD. This one has been in the works for just about that long. i agree russ. things just take so long. nigels book has been basically done for 5 years and still is not published. it should be the best DP book ever when it does come out though. back on topic, i would like to know who can confirm that some ‘made in japan’ footage has truly been found!?! i find it too good to be true. and, as mentioned by others, some quality details…. b&w, color, close, distant etc. Has anyone thought to ask which one of the 3 Highway Stars is on the 8mm and which of the other tracks is from which nights as MIJ was a comp of tracks off the 3 nights. it would be great to know more about this as it is the best news about DP every to come out ever. like everyone else i hope it comes out soon i do not care if it is just short bits as londs as some syncs them. There is a clip of that running around, Black Night if I remember correctly… you’re sitting on stuff there is demand for. I was happy to see the Munich 93 pro shot footage recently that I didn’t know about. Some nice little bits of footage. Well Crimson Ghost I can probably find the old VHS-cassette and I still have a VHS player but how the hell do i transfer it to U Tube? Best to send it to someone who will make a DVD and send it and a DVD back to you. Then you can just copy it to your computer and upload it to YT if thats what you want to do with it. But it’s done by simply plugging the VCR into the computer, then putting in on your hard drive using a program, then uploading it to YT or whatever. Thanx but that is kinda old stuff now and from a questionable source as well. is not a big fish? I can’t believe this.They have to do something with the rest of the film, I mean release it somehow!They should fix it up for a DVD thats rare and very unvuable film, like with Inglewood 1968, which I believe with work could be fixed atleast so you dont get a headache halfway through.And Hamburg in 1971, and I actually put up film of Speed King from the First British Rock Meeting in Speyer, Germany in September 1971 although it was removed when my account was suspended sometime last week without notice.Its colour and pro-shot.If the rest of the concert was found it could be released officially on DVD.And lest we not forget the short video of Stormbringer in Germany in ’75 with Ritchie still in the band, I know the rest is hiding somewhere!Theres also 11 minutes of silent 8mm colour film from Rotterdam in January ’71, which is in good condition.Theres 40 seconds of Speed King on youtube, and the guy is selling the whole film and DVD through email.I think some of its on that montage video from ’71.The big mystery of that video is the pro-shot colour Highway Star at the end.My guess is the concert from Stuttgart in February 1972, but I cant be too sure.Theres also a long interview with Tommy Bolin on TV from 1975, I dont know if that would be worthy for a Deep Purple DVD though.As far as Mk III goes, that Stormbringer video is the only thing that wont be released officially after this DVD comes out. Yo sabía que algún japones tuvo que haber grabado esos conciertos…..
LONG LIVE ROCK N` ROLL!!!!!! !